There's no body in the family plot. A wealthy old woman hires a con man (Bruce Dern) and a phony psychic (Barbara Harris) to find her long-lost nephew. The results are diabolically funny as this suspense-comedy combines mystery and mayhem in nonstop excitement from beginning to end. Co-starring Karen Black and William Devane. 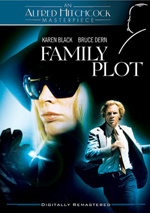 A great career came to an end when 1976’s Family Plot hit the screens, as it represented the final flick from the legendary Alfred Hitchcock. We meet a psychic named Blanche (Barbara Harris). A wealthy old lady named Julia Rainbird (Cathleen Nesbitt) hires Blanche to use her alleged supernatural skills to locate the illegitimate child of Rainbird’s sister, a person who would be the sole heir of the family fortune. Along with her cabbie/aspiring actor boyfriend George (Bruce Dern), Blanche undertakes this search. In the meantime, we meet Fran (Karen Black) and Arthur (William Devane), a pair who kidnapped wealthy Victor Constantine (Nicholas Colasanto). They return him in exchange for an enormous diamond that they plan to pawn in Europe. The movie traces the two tales and how they intersect. Since Plot represents Hitchcock’s swan song, it’d be nice to report that it qualifies as a classic. I can’t make that claim for the flick, but I think it marks a moderate return to form for the director. After the heights of 1963’s The Birds, Hitchcock created movies that ranged from pretty decent to disappointingly dull. While Plot doesn’t soar, it does manage to keep our attention across its 120 minutes. The dual plots that eventually intersect work pretty well. At first, it seems difficult to imagine how the film will interconnect them, but it slowly melds the two, and it does so in a smooth, believable manner. Well, as believable as a story like this can be. We need to accept plenty of potential holes and liberties to enjoy this sort of tale, but Hitchcock makes those leaps of faith go down without too much effort. The situations and characters intrigue us enough to allow us to forgive the gaps. Given the darkness found in so many Hitchcock films, Plot feels surprisingly light. Oh, it demonstrates some of the usual black comedy, but not to the standard degree. It comes across as almost chipper and good-natured at times; I don’t expect that from Hitchcock. This doesn’t mean Plot comes across as something by a different director, as it clearly remains a Hitchcock work. I just think it’s a little softer than usual. This doesn’t mar the flick in general, though I do dislike the comedic bent during one sequence. We see a runaway car that seems destined to crash and kill its inhabitants. Rather than play this for its natural tension, Hitchcock turns it into a slapstick piece due to the hysterics of one of the folks involved. I’d prefer it if he’d gone for the drama, as the comedy makes the scene rather absurd. Despite the occasional misfire, though, Family Plot remains a generally enjoyable flick. It presents an intriguing tale and allows events to unfold in a manner that keeps us involved. It’s not classic Hitchcock, but it’ll do. 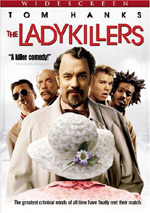 Family Plot appears in an aspect ratio of approximately 1.85:1 on this single-sided, double-layered DVD; the image has been enhanced for 16X9 televisions. As the most modern Hitchcock movie, shouldn’t this one look the best? Unfortunately, Plot offered an erratic and often substandard transfer. Excessive grain created many of the problems. The level of the grain varied, but it remained a nearly constant distraction that gave the movie a blotchy, flat look much of the time. Other source defects betrayed instances of specks, marks, nicks and hairs. These weren’t as prominent as the grain, but they showed up more frequently than I’d like. Colors usually looked drab. Some shots displayed good vivacity, but most seemed rather flat and dull, and skin tones took on a brownish appearance. At least blacks seemed reasonably deep, but shadows were somewhat thick, partially due to the way the grain obscured those shots. Sharpness also seemed erratic. Some shots displayed decent delineation, but quite a few looked moderately soft and ill-defined. Moderate edge haloes also distracted, though the flick lacked signs of jagged edges or shimmering. This wasn’t a terrible transfer, but I thought it only deserved a disappointing “C-“. As for the monaural audio of Family Plot, it fared nicely after all these years. Music sounded the best, as the score was surprisingly robust and dynamic. Effects lacked the same vivacity, but they appeared clear and accurate. Dialogue was also concise and natural, and no source noise marred the presentation. I felt very pleased with this high-quality single-channel track. Among the extras, we locate a documentary called Plotting Family Plot. This 48-minute and 21-second program mixes movie snippets, archival elements, and remarks from director’s daughter Pat Hitchcock O’Connell, assistant director Howard Kazanjian, Universal Studios executive Hilton Green, set designer Henry Bumstead, composer John Williams and actors Bruce Dern, Karen Black, and William Devane. We learn about the source novel and its adaptation, pre-production and working with Hitchcock, visual effects, cast and crew, locations and sets, storyboards and planning, the score, and shooting specific scenes. Most of the prior Hitchcock documentaries proved informative and engaging, and that trend continues here. While it doesn’t follow the most logical path through its subjects, it covers a lot of useful subjects and throws out plenty of fun stories. It becomes a consistently enjoyable program. Storyboards appear for “The Chase Scene”. This area uses still frames to show the storyboards. I like the inclusion of the drawings, but I’d have preferred a split-screen running comparison to this still presentation. The usual pieces cap off the disc. We find two moderately interesting trailers; Hitchcock appears during both, but he doesn’t add enough to make them great. Under Production Photographs we find 87 stills. These mix shots from the set, publicity images and ads to create a good collection. Finally, text Production Notes provide some basics about the flick. A great career came to an end with Family Plot, Alfred Hitchcock’s final film. While he didn’t go out on top, he did end things with a pretty good effort, as Plot was arguably his best flick since 1963’s The Birds. The DVD suffers from spotty picture but it offers good audio and the usual allotment of interesting supplements. I wish the transfer looked better, but the DVD does enough right to earn my recommendation.